While the job market may still look grim for those looking to replace their good-paying office or manufacturing jobs, opportunities are expected to abound for a host of jobs paying less than $10 an hour, everything from cashiers to home care aides. Low-wage jobs have always been part of the economic landscape, but wages have been suppressed for many years now. Part of the reason is supply and demand, Creticos said, as the huge baby boomer labor pool flooded the job market and, thanks to the bad economy, are working longer, many past retirement age. Creticos calls this phenomenon the “down-waging” of American jobs. Many of the lowest-paying jobs were once seen as the domain of younger workers who were first starting out in the work world, but increasingly these positions are survival jobs for midcareer folks who have been downsized, said Randall Hansen, a workplace expert with Quintessential Careers. Rufus Burnley carries a tray of grilled chicken in 2008 at Kentucky Fried Chicken in Indianapolis. Alas, this job category has the not-so-great distinction of being the lowest-wage gig in the country, bringing in a measly $8.71 an hour, or $18,000 annually. Most of these jobs require minimal education and many are part time. Despite the small paycheck, long hours, and hard work, lots of people hold these jobs. The occupation is now the fourth largest in the country with 2.7 million workers. This kind of work, which the BLS projects will increase by 10 percent in the next decade, is often seen as a dead-end job. However, if you have plans of one day going into hospitality management, it’s a good idea to spend some time in the trenches, advised Quintessential Careers’ Hansen. But not too long, he added, or you’ll risk being seen as a grunt worker in the eyes of management. There are roughly half a million dishwashers in the United States, and they earn about $8.81 an hour. The state with the most dishwashers is Florida, with 42,000. That state also pays among the lowest hourly wage for the job, $8.62, while Nevada pays the highest at $11.29 an hour. Training is minimal to nil, but dishwashing jobs are often seen as a stepping stone to jobs as servers in restaurants or other food-service establishments. When he was 12, Michael Dell — who went on to found Dell Computer — got a job as a dishwasher in a Chinese restaurant and quickly was promoted to maitre d’. 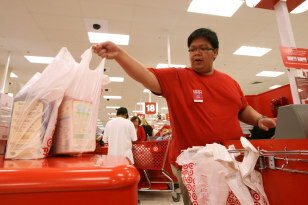 Target cashier Dino Pacheco bags items for a customer as he rings them up at a Target store in 2008 in Daly City, Calif.
Cashiers can be found everywhere from fast-food shops to clothing stores. The job is No. 2 on the BLS’s list of biggest occupations with a workforce of about 3.3 million, behind only retail sales people with 4.2 million. But unfortunately, the pay is crummy. Cashiers make $9.15 an hour, or $19,000 annually; about half of those who work cash registers are part timers. Even though most cashiers are trained on the job, they typically need some understanding of math, and many employers prefer applicants with high school diplomas, according to the BLS. Background checks are often required for these positions because workers handle money. The profession has a high turnover rate, and the government expects the outlook for this job category to be good, although it’s expected to grow at only 4 percent in the next decade. You may never think to tip your host or hostess when you go out to eat. Well, maybe you should think again. These jobs bring in $9.23 an hour, compared to $9.80 an hour for waiters and waitresses. Maybe they don’t do the kind of heavy lifting the wait staff does, but it’s not only about greeting you when you get to the restaurant or lounge door. They also take reservations, direct you to the bathroom, and sometimes they act as cashiers. And they have to do all this, typically, wearing a nice outfit — or at least as nice as they can afford on a salary of $19,000 a year. Forget the Armani. Florida and California, lands of amusement wonder, top the list of the most people employed in this profession, with 30,410 and 40,640 workers respectively. In California, workers in this category make $9.57 an hour; but in Florida, land of Disney World, the wage is $8.90 an hour. Alas, Mickey Mouse isn’t spreading the joy to workers’ pockets. Wages there for these jobs are below the national mean hourly wage of $9.35 an hour. These employees, who typically get on-the-job training and are expected to have good customer service skills, do everything from collecting tickets when you wait in line to ride the latest roller coaster to removing unruly patrons who have had too much cotton candy. If you’re a movie buff, you’re in luck. The BLS expects jobs for ushers and ticket takers to jump nearly 12 percent in the next 10 years. Watching all the movies you want is a great benefit, especially given the wages you’ll be bringing home — $9.43 an hour. But getting a job as an usher at your local theater doesn’t mean you’ll end up in Hollywood. The job is listed under the BLS’ “movie picture and video industries,” but even the government doesn’t give it much credibility. 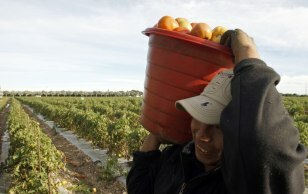 A farm worker carries a bucket of picked tomatoes June 4 in Homestead, Fla.
Often cited as the job Americans don’t want, farm workers make $9.51 an hour, and most of the work is seasonal, strenuous and dangerous. About seven in 10 agricultural workers are born outside of the United States. The bulk of these jobs, nearly 150,000 out of the total 233,000 jobs, are in California, and workers learn quickly while in the fields. The job opportunities in this profession are expected to skyrocket by nearly 50 percent in the next 10 years, above and beyond the 630,000 people doing the work right now. The government expects the huge jump because of the graying of the population and the care they’ll need to deal with escalating health problems they’ll face. As a result, they’ll need help if they’re going to remain at home. If only these physically demanding jobs paid a bit better. At $9.75 an hour, workers doing this job — which has a high rate of work-related illnesses and injuries — won’t be able to put much money away to take care of themselves in their golden years. Eve Tahmincioglu writes the weekly "Your Career" column for msnbc.com and chronicles workplace issues in her blog, CareerDiva.net.